in Portland at The Rose Garden. I watched them film the show and release it on dvd, and bought one and can still watch it whenever the mood strikes me. This was a cool show, but not nearly as good as the Seattle show in 2006! I was impressed. 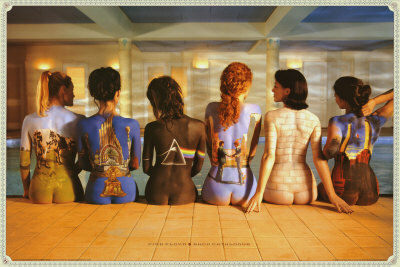 The entire “Dark side of the moon” record and a 3 hour concert packed full of Pink Floyds best classics. Great sound, video screens, imagery, flying pigs and confetti, moon men, and the works. unless you hit Europe or something and it may be worth the plane ticket! I am still reliving that show. Impossibly killer. I cannot rave enough! WOW says it best! Amazing straight A’s! Having seen this man 3 times live that is saying a lot! 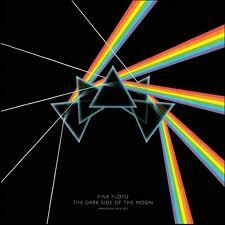 SECOND HALF: Dark Side of the Moon. (Whole album! Striking)! ENCORE: *The Happiest Days Of Our Lives *Another Brick In The Wall (Pt 2) *Vera* Bring the Boys back Home *Comfortably Numb. So Here is a quick local review of this great show in Seattle! 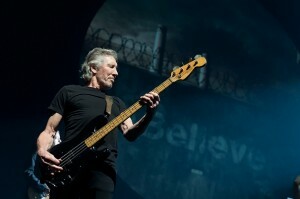 Roger Waters transformed KeyArena into a place where pigs flew, lunatics were on the grass and lost souls swam in a fish bowl Thursday night. Waters and a 10-piece band performed more than two hour’s worth of material spanning the epic catalog of his former band, Pink Floyd, taking the capacity crowd on a masterful, mind-bending and, at times, seemingly maniacal musical journey. Of course, that’s maniacal in a way that reflects the twisted genius of what many consider to be the greatest rock band of all time. 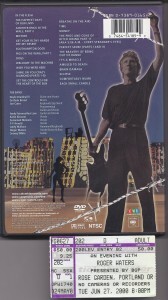 The set began with “In the Flesh,” one of several tracks from “The Wall” that were performed, including “Mother” and, of course, “Another Brick in the Wall (Parts 1&2)” along with “The Happiest Days of Our Lives.” From the iconic imagery of marching hammers to the unmistakable bass riff to “Money,” the show was 100 percent Floydian in nature. A large inflatable pig with “Impeach Bush Now” and other political messages written on its sides the crowd during “Sheep.” Only at a concert filled with performances of Pink Floyd songs could a pig fly, and the floating swine made it feel like the real deal despite Waters being the only member of the band on stage. 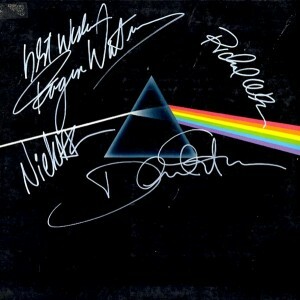 The absence of former Floyd bandmate David Gilmour was heavily felt during the songs on which where his vocal parts were handled by a guitarist or keyboard player. But Waters made up for that with a gripping new solo song that, in keeping with the Floyd tradition, heavily criticizes the current political climate. 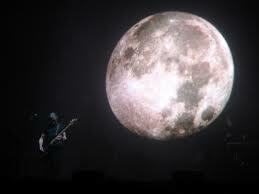 The centerpiece of the show was the performance of Floyd’s landmark record “Dark Side of the Moon” in its entirety during the second half of the concert. The album, released in 1973, seems to transform into something different each time you listen to it. (Ask anyone who has watched “The Wizard of Oz” while listening to “Dark Side.”) It was more powerful and grandiose performed live, making Waters’ concert one of the best, if not most ambitious, shows of the year. But there were no images of Dorothy or Oz on display during “Dark Side,” just songs about lunatics, time and money and that thumping heartbeat signalling the entrance and exit points of madcap journey maestroed by rock’s most epic songwriter! (And yet another raving review)! 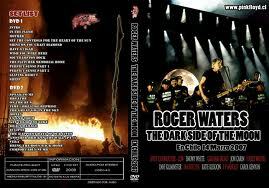 Roger Waters concert! 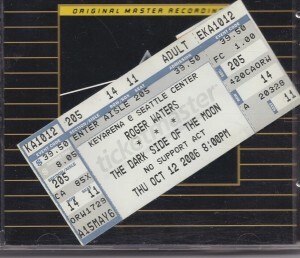 I was privileged to see Roger in two different venues. 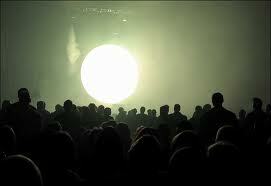 One, in an open-air venue, Hollywood Bowl. And the other, an indoor venue, at Seattle’s Key Arena. Gone are the huge flame throwers that shoot flames four to five story high. Gone are the rooftop fireworks. Gone is the giant prism over the stage. 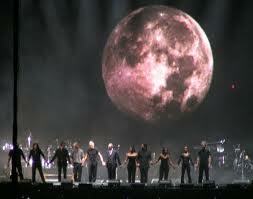 What the Key Arena offered was the incredible surround sound especially during the DSOTM segment. 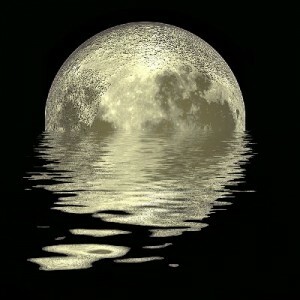 You can feel the sound, and hear it travel! 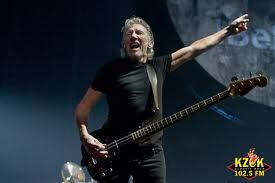 Roger could have just turned off all the lights and just played, and it would still have been perfect. He could have done without all the visual stimuli, and one would still experience a moving and memorable evening with his words and music. Nick was not there but the drum solo for Time was amazing. It was like one giant sound demo room for Bose speakers. I was able to get four more tickets from a co-worker who was unable to go. I brought my daughter, two cousins and brother-in-law. They didn’t know what was in store for them prior to the show but they were certainly very impressed after. I commented, that’s just Roger, showing how it’s done. Roger obviously enjoyed the Seattle crowd. He even signed a couple of autographs before he left the stage after the DSOTM segment. This show could possibly be the last of the tour; hopefully it won’t, but what a memory to cherish. But of course, it is certainly an individual experience as njk (Hollywood Bowl, 6th) mentioned in his review. I did not mention in my review (Hollywood Bowl, 5th) that Neil Young’s songs were being played prior to the start of the shows. Wearing a Neil Young hat from the CSNY Freedom of Speech tour, I was hoping that songs from Neil’s new album would be played. forum for this but here it is anyway. I agree with the views of Mr. Waters and Mr. Young. I am grateful that these “outsiders” are here in America, and are raising awareness since U. S. policies have global effect, and creating a big mess. I believe that Bush should be sitting next to Sadam, and is tried for war crimes himself. Unlike, California Governor Arnold Schwarznegger, who made adjustments with his policies in response to his constituents, and is slowly gaining back their approval; Bush is stubborn, whose credibility is shut, and whose mentation is in question. Unlike, the British politicians, who forced Blair to resign; the do-nothing U.S. Congress is in perpetual gridlock and power grab. It’ll be great if Roger and Neil can be on the Keith Olbermann show. By the way, Nelson is my first name. It is somewhat misleading because I’m a first-generation Filipino-American. I retired from the U.S. Navy after serving honourably for 20 years, and currently; I’m serving my community as a registered nurse. I believe that I earned my soapbox. We again remind readers that the views expressed in reviews published on this site are not necessarily those of A Fleeting Glimpse.